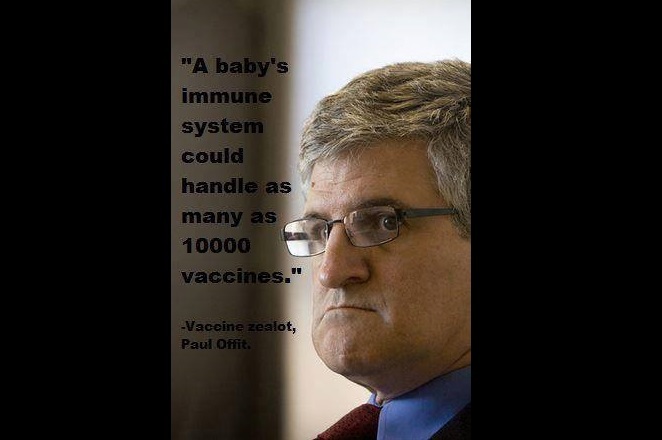 Dr. Paul Offit was at the National Press Club in Washington, DC last night peddling his new book, “BAD ADVICE: Or Why Celebrities, Politicians and Activists Aren’t Your Best Source of Health Information.” It is clear that Dr. Offit desperately wants to be the authority on vaccines. He already is the industry shill, but is he the authority? The opinion of the crowd in attendance at the event was a resounding NO. Children’s Health Defense advocates, parents of vaccine-injured children, and scientists came from all over the United States to ask Dr. Offit questions. They pointed out in their respectful, thoughtful questions that they do their own research. Although Offit declined to take questions directly from the audience, it was a good day for parents everywhere to see Dr. Offit forced to have a moderator filter the written questions he did address down to the very basics so he could answer with one of his canned responses. And the harder questions from the group were never presented to him. Today’s intelligent parents don’t need a pharmaceutical tycoon physician from Philadelphia with a “gift of gab” telling them what the industry wants them to hear.